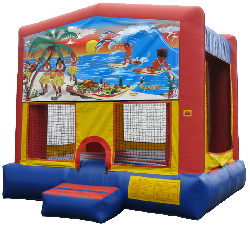 This Tropical Luau bounce house creates a bouncing paradise. It is ideal for luau's and tropical fun party themes. Similar themes include the Under the Sea bounce and Tropical 3D combo.